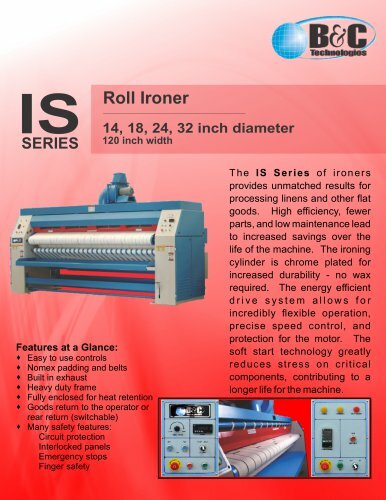 Roll Ironer 14, 18, 24, 32 inch diameter 120 inch width Easy to use controls Nomex padding and belts Built in exhaust Heavy duty frame Fully enclosed for heat retention Goods return to the operator or rear return (switchable) · Many safety features: Circuit protection Interlocked panels Emergency stops Finger safety The IS Series of ironers provides unmatched results for processing linens and other at goods. High efciency, fewer parts, and low maintenance lead to increased savings over the life of the machine. The ironing cylinder is chrome plated for increased durability - no wax required. The energy efcient drive system allows for incredibly exible operation, precise speed control, and protection for the motor. The soft start technology greatly reduces stress on critical components, contributing to a longer life for the machine.